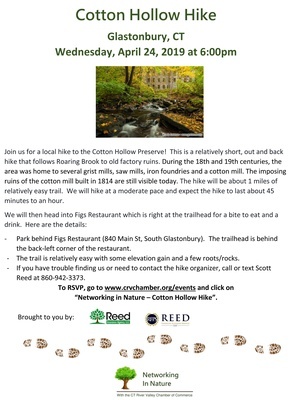 Join us for a local hike to the Cotton Hollow Preserve! 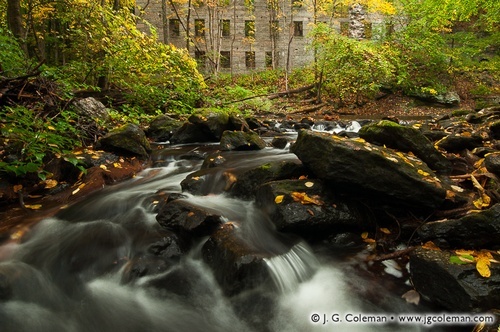 This is a relatively short, out and back hike that follows Roaring Brook to old factory ruins.During the 18th and 19th centuries, the area was home to several grist mills, saw mills, iron foundries and a cotton mill. The imposing ruins of the cotton mill built in 1814 are still visible today. The hike will be about 1 miles of relatively easy trail. We will hike at a moderate pace and expect the hike to last about 45 minutes to an hour. Park behind Figs Restaurant (840 Main St, South Glastonbury). The trailhead is behind the back-left corner of the restaurant. The trail is relatively easy with some elevation gain and a few roots/rocks. If you have trouble finding us or need to contact the hike organizer, call or text Scott Reed at 860-942-3373.